Mobile crusher station mainly used in metallurgy, chemical industry, building materials, water and electricity often need to move material processing operations, especially for highways, railways, hydropower projects stone and other liquidity operations, the user can type according to the processing of raw materials, size and material requirements of the different product configurations using a variety of forms. Mobile Crusher Plant is a kind of stone crusher series and also the most common crusher in the stone crusher series. Mobile crusher plant is adaptable to all mobile crushing needs, mobile crusher plant sets up a new range of business opportunities for contractors, quarry operators, recycling and mining applications. The mobile crusher plant for stone crushing features low transportation cost, flexible configuration, easy maintenance, etc. 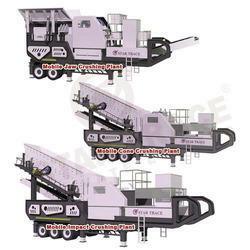 The mobile crusher plant can not only work independently, but also be combined with other machines in a production line. There are mainly several kinds of mobile crusher plant, that is jaw mobile crusher plant, cone mobile crusher plant and impact mobile crusher plant. The mobile crusher plant (mobile crushing and screening plants) is applied to multi stage crush large materials, and then screen the discharges according to their different specifications. The whole set plants is widely used to mine, building material, highway, rail way and hydro power industries, etc., finish crushing and screening operations at one time, produce required size and output for consumers. The mobile crusher(mobile crushing and screening plants) is composed of primary crushing and screening station and secondary one, belt conveyor, etc. every crushing station is an independent working unit, they can respectively assume their different responsibility, and the belt conveyor is responsible for material transmitting and piling up between each crushing station. 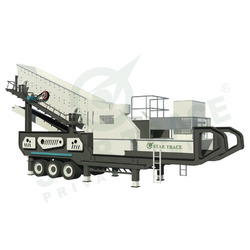 This series of mobile crusher plant incorporates all the equipments together on one truck, which has high chassis, narrower body compared with other trucks, this ensures the crusher plant can be easily transported on highways and moved to crushing sites, so the mobile crusher plant is able to achieve on-site crushing without material transporting from one place to another place. In addition, the lengthened plant is able to transport the final products to the motor-lorry directly. the mobile crusher plant can start to work soon even in the bumpy ground without re installation, so it saves more time and money than fixed crusher plant which needs to install individual equipment one by one. Mobile crusher plant can work independently or together with other devices according to coarse crusher or fine crusher requirements. Side discharging chute supports more screening and transporting ways. diesel generators of the incorporated plant can not only supply power for this plant, but also supply power for other plants of the process flow. The integrative feeder and screen. The integrative truck loading of belt conveyor, vibrating screen and crusher. Direction-changing axis of traction for the road transportation convenience and job site penetrate deeply. Truck loading installation supporter for the fast and convenience of equipment residence. The integration of truck loading motor and control panel. Mobile Cone crushing plant provides a new field of business opportunities for contractors, quarry operators, recycling and mining applications. It offers high efficient and low cost project plan without environment limit for the client. Each machine is specially designed according to the characteristics of portable crushing, not just "bring to make combination" electrical components, motor, bearing and other important parts all use top-notch brands china or abroad. As specailly designed, it with scientific structure, tight and reasonable the operating station is set at the place where can easily observe the equipments running, with remote control, safe and convenient. As dedicated equipment, the portable crushing plant running smoothly; as professional design, the portable crushing plant saving 15-30% energy comparing with similar plants. the application, transport,asembly and disassembly, maintenance of every signgle machine can be at our engineer's ideal design. 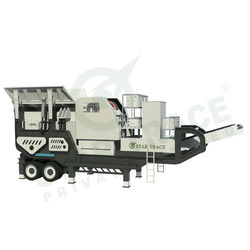 Star Trace Mobile Impact Crushing Plant are a new design that produces an excellent cubical product. This impact crusher produces a high ratio of reduction. The impact crusher is built for durability and simplicity of operation. Adjustment is easy from the exterior of the crusher. Maintenance is simple through inspection doors, and electric power unit is standard. Star Trace impact crushers offer greater reliability, high production and are ideal for portable mounting. It is widely used for crushing hard materials in the following industries: mineral, quarry, water conservancy and hydro power, highway,railway, chemical industry, building materials and so on. Mobile crushing plant are mainly used in metallurgy, chemical industry, building materials, water and electricity often need to move material processing operations, especially for highways, railways, hydropower projects stone and other liquidity operations, the user can type according to the processing of raw materials, size and material requirements of the different product configurations using a variety of forms. Integrated unit equipment installation form, eliminating the sub components of the complex field infrastructure installation and reduce the material consumption hours. Reasonably compact unit space layout, improve the flexibility of field presence. Car mobile crusher station sites is high, the body is smaller than the width of trailer operation, small turning radius, easy to ordinary highway driving, easier to break the rugged field area with poor road environments. Entered the site for the shortcut saves time, stationed in the construction area is more conducive to rational, for the whole crushing process provides a more flexible space and reasonable layout configuration. Mobile crushing station can be the first line of the material on-site crushing, eliminating the material transported from the scene and then broken in the middle part, which greatly reduces the cost of transporting materials. Another more extended set directly to the broken material into the transport wagon bucket, turn away from the scene. Integrated series mobile crusher station, can be used independently, can also target customers process the material type, product requirements, providing a more flexible process configuration to meet user mobile crushing, screening and other mobile requirements, so that the resulting organization, more direct and effective transport stream, to maximize the reduction of costs. Mobile crusher for crushing, grinding and sieving system that can stand-alone group of independent operations, but also components of the system can be flexibly configured unit joint operations, side discharge hopper material handling methods for the screening provides a variety of configuration flexibility, integration of diesel generator unit configuration in addition to the power supply unit, you can also configure the workflow system targeted to the power supply unit combined, reliable repair convenient. Looking for Mobile Crushing Plant ?